The FAI is pleased to announce the list of the winners for the 2015 FAI Young Artists Contest. An international jury selected the three best paintings for each of the categories: Junior (ages 6-9), Intermediate (ages 10-13), Senior (ages 14-17). Their authors will receive FAI gold, silver and bronze medals. 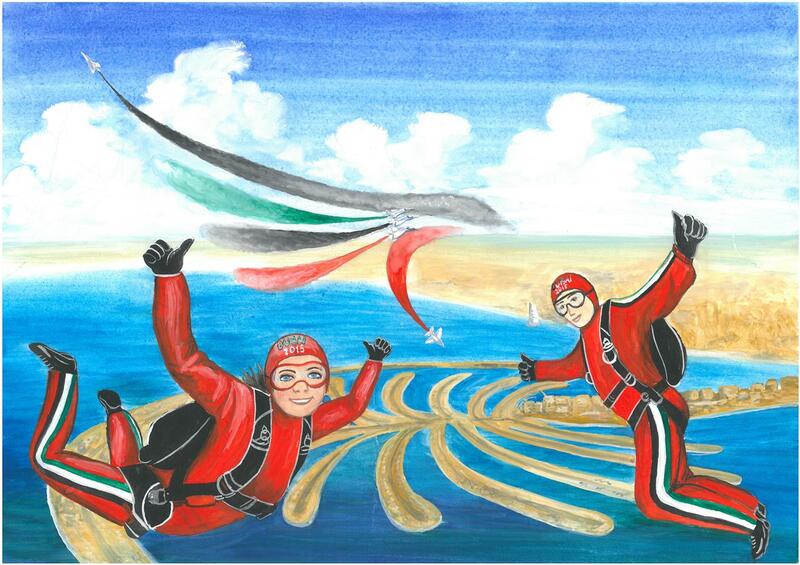 The theme for this year’s competition was "Create a poster for the FAI World Air Games Dubai 2015" on the occasion of the FAI flagship event which will take place from 1 to 12 December 2015. “When choosing the FAI World Air Games as this year’s theme we hoped to make thousands of young people aware of this fantastic competition. We also saw it as a great opportunity for them to learn more about the sports featuring in the event programme and the exciting city of Dubai. Looking at the wonderful paintings we received, I am delighted to see that this objective has fully been reached!” said FAI Young Artists Contest Coordinator Suzie Gebb. The FAI Young Artists Contest was first organised at a national level in 18 member countries of the FAI: China, Cyprus, Egypt, France, Hong Kong, India, Italy, Japan, Jordan, Lithuania, Nepal, Philippines, Poland, Russia, Switzerland, Turkey, United Kingdom and USA. The national winning paintings were then sent to the FAI Head Office, where the jury selected the international winners. The winning paintings can be viewed in a FAI photoset on Flickr. The FAI warmly congratulates the winners of the 2015 FAI Young Artists Contest and thanks the FAI Members for their participation. The theme for the 2016 edition of the contest will be disclosed in the next few months. Download the Press release in Arabic, English, French, German, Russian andSpanish.